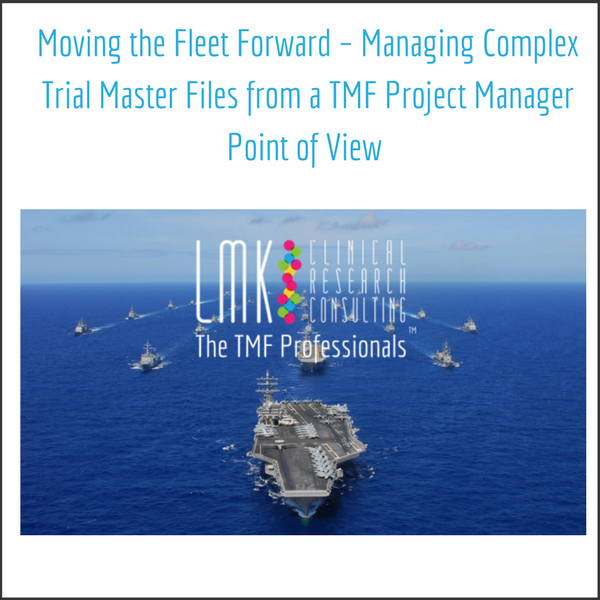 Running a tight ship while utilizing a complex TMF offers many challenges. Although advanced document management systems are designed to simplify the process and minimize potential gaps, there are still many moving parts. Regardless of how advanced your TMF is, it will never remove the need for basic human interaction. With a complex TMF you have the opportunity to pre-determine and design the study specific document list (SSDL) and create placeholders (PH) for expected incoming documentation. This may sound simple, but it’s only the first layer. As new countries and sites activate in the system, the TMF activities ramp up consecutively. New milestones and events play a part in evolving the SSDL. Accurate set-up and continual upkeep is vital to avoid future time-consuming clean-up and extraneous requests. Speed of the Captain, Speed of the Crew – Being a successful study owner is just like being the captain of a ship. They work across multiple organizations, bring the functional lines together, impress upon teams the importance of the TMF, identify risks… even deliver training to team members when needed. Like a captain, the study owner’s first initial meetings with the team should establish guidelines for a successful relationship, and secure agreements for working together so that all parties are clear. Strong communication skills, project management and analytical thinking are essential to the role. Assess the Waters, Don’t Just Rely on the Map – Inform the team of any areas of concern identified during regular maintenance or from your TMF Quality Check (QC) activities. A study owner should assess requests for manual placeholder set-up. Think big picture. Ask yourself: “Should a placeholder already be set up for this document? Is it possible there may be an event available that wasn’t run? Is this an appropriate manual request?” Taking the time to assess the request and to set up the additional placeholders according to the processes will avoid extra workloads, lengthier QC and avoid potential gaps. Sailing Into Safe Harbor: TMF Study Lock – It cannot be stressed enough that if the processes and QC activities are followed throughout the lifecycle of a study, the final QC should be minimal and will result in a timely and inspection-ready study to be locked and archived in the TMF. As Study Owner Leader, I function somewhat like an Admiral to this purposed fleet. To provide a little insight into my role, I oversee 3 organizations and over 60 TMF Study Owners managing almost 400 studies. It’s my task to guide the fleet through murky waters, identify potential risks before they surface, and clear the way to navigate safely through. Knowledge is power; mindfulness is a choice (or discipline?). I can’t possibly strive to be a strong leader without fully understanding the systems, processes and resources available that lead us to the answers we need. I try to model this commitment daily, by teaching others where to find the answers rather than just handing them over. Staying in tune with multiple TMF repositories keeps you current, no matter how simple or complex. Scanning the Horizon from the Crow’s Nest – In order to provide relevant leadership, I monitor the progress of each study to steer clear of risks, making sure teams follow through to resolution. My colleague Ruby Scott, LMK and I recently teamed together and developed a simple status report for the TMF Study Owners to keep us informed of current activities, changes in SSDL status and challenges teams are facing. We have streamlined this report to collect additional information needed and all but eliminated the number of trackers needed to collect the information. This innovation allows us to monitor with quality and efficiency. With one click of a button, these simple status reports integrate with TMF reports from the system, providing us with all the necessary information needed to monitor and report to the client. Learn the Ropes! – Training is one of my personal commitments. I feel it’s necessary to build a strong foundation. Taking the time to reflect on areas of need and to develop a curriculum helps to ensure an audit-ready TMF at all times. My advice is always to focus on utilizing the resources available to find answers, allow teams to share their best practices and always pay attention to inconsistencies and address them through training when possible. Don’t be afraid to review the SOP’s, processes and guidelines and offer suggestions to keep them up-to-date and available for other teams to follow. This provides consistency and clarity across organizations. Be a fisherman, not a pirate – Gaining the trust of the Sponsor, Study Owners, Organizational Leads and each study team is vital. I work to accomplish this by listening, understanding and being a stickler for follow-through. It is important to be approachable while setting high expectations for those you oversee, to give them something to reach for. Setting realistic deadlines also helps. Most of all, lead by example! I have worked with the simplest to the most advanced trial master file systems and truly enjoy navigating the fleet through calm waters, avoiding the storms and working together with each crew when the seas are high. Although the work has its challenges, these tips can help to successfully manage any turbulence. Teamwork takes critical thinking and strong communication from all parties. Success takes a unified team with focused goals and a high standard of practice, with the unwavering gaze of a ship’s captain: a strong project manager to show the way.